We can’t all be glamorous jet-setters with a team of concierges to see to our every need. Some of us have to settle for the budget seats and cheap hotels, so it’s no surprise that you might look for an affordable travel app to replace the bulky and sometimes pricey guidebooks. It should be just as good, if not better, right? Unfortunately, in the case of Sights to See, it doesn’t quite work out that way. Sights to See promises you the ability to construct your own personalized guide book by giving you the means to enter in a particular location and cherry-pick the tourist sights you’re most interested in. The app then downloads guides for those places on to your device, as well as maps of the area, which you can access even if you’re offline. What Sights to See doesn’t make immediately obvious is that the “guides” are really just Wikipedia articles of the locations in question. Now, I loves me some Wikipedia and have been known to spend hours there, but an effective guidebook it most definitely is not. The differences between a good travel guide and an encyclopedia are fairly profound, and I sort of pity the poor traveler who tries to mind his way around with only Wikipedia as his guide. It’s certainly functional and factual, but while you’ll be well-versed in the historical minutiae of a location, you won’t have access to the key details most travelers actually care about, like hours of operation, admission rates, best walking paths, or even where to get lunch. 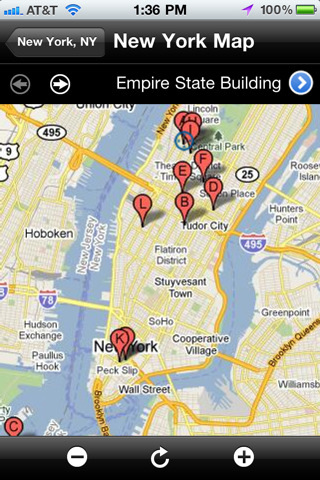 Sights to See also allows you to download maps ahead of time and store them on your device for easy offline access. Now, a clean Google maps and Wikipedia interface is nice, and offline access is plenty useful, but it’s almost certainly not worth the exorbitant $5.99 price tag. I will admit that the interface is reasonably more organized than trying to wade through a mass of bookmarks, but don’t kid yourself into thinking you’re getting any original content here. All of the information available through Sights to See is freely available on the Internet, and always well suited to the task. All you are paying for is a relatively tidy interface to access it through. Living next to one of the more popular tourist destinations in the Boston area, I don’t generally have a lot of patience with the busloads of clueless out-of-towners who get in my way, but a traveler trying to get around with Sights to See as their guide would have my deepest sympathies. Make of that what you will. 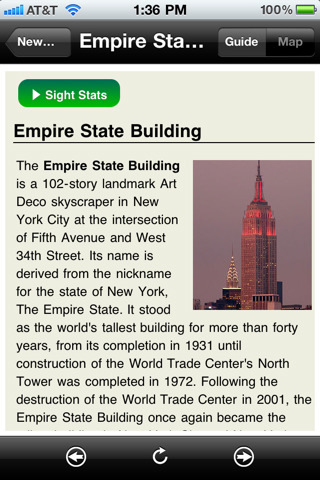 AppSafari review of Sights to See was written by Tracy Yonemoto on October 28th, 2010 and categorized under App Store, Education, Maps, Reference, Travel. Page viewed 3578 times, 1 so far today. Need help on using these apps? Please read the Help Page.